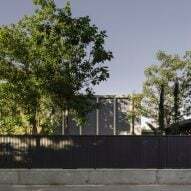 Spanish studio Canales Lombardero designed this brick-clad house in Seville with a double-height concrete portico to connect its living spaces with the garden. 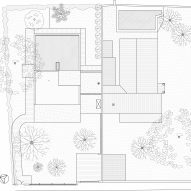 The studio headed by Francisco González de Canales Ruiz and Nuria Alvarez Lombardero designed Perea Borobio House for a retired couple who needed a flexible space capable of accommodating visiting family. The two doctors invested their life savings into the building, which also needed to fulfil both their own needs and those of future generations who will eventually inherit the house. "Durability, solid construction, energy efficiency and the recycling of client materials are set as priorities for the construction," said the architects. "Flexibility for future uses is articulated through the restraints associated with these priorities and by setting a clear system of stable relations around which adaptation and change can occur." 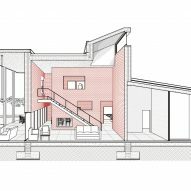 The adaptability demanded by the brief was achieved by creating an envelope formed of pink brick cavity walls that encloses open spaces suited to a range of possible configurations. 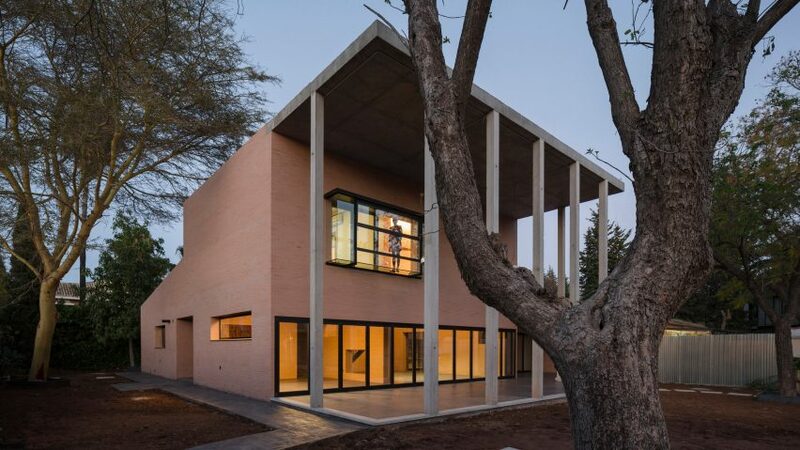 Fire bricks salvaged from the site of a halted development were used to construct the 35-centimetre-thick walls, which act as the main structural support for the house and provide a highly efficient thermal envelope. 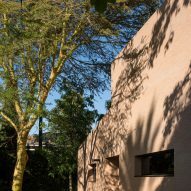 The architects developed the plans for the building's energy strategy alongside experts in sustainability at the Architectural Association in London, where they have both spent time studying and teaching. The bricks and concrete slabs are left exposed in their raw state to improve their ability to absorb heat during the day and allow it to disperse at night, reducing the need for artificial heating and cooling. 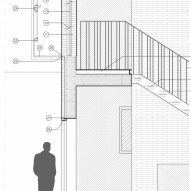 In the public areas on the building's ground floor, the walls are slightly offset and interrupted by openings that allow partial views between interconnected spaces designated for different functions. An entrance at the side of the house leads into a lobby illuminated by a skylight, from which several of the rooms can be viewed through gaps between the staggered walls. The lobby connects with a double-height living area that extends all the way to a row of glass doors leading out onto the portico. 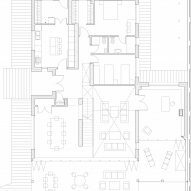 Clerestory windows facing to the rear of the building allow natural light to flood into the room. Viewed from the walled garden at the front, the house resembles a minimalist take on a colonial mansion, with its row of slender concrete pillars supporting a projecting concrete roof. The prefabricated columns were developed specifically with the minimal possible dimensions required to both fulfil local planning regulations and achieve the open, spacious feel the clients requested. 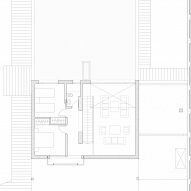 The glass doors lining the ground floor can be folded away on either side to open up the living space and adjacent dining area to the outdoors. A protruding window with a glass floor on the upper storey cantilevers out over the patio. A staircase with open treads that extends along one side of the living-room wall ascends to a first floor containing two bedrooms and an additional lounge area.